Saturday morning, embarkation to the Eurodam will begin at 11:30 AM and conclude at 2:30 PM. 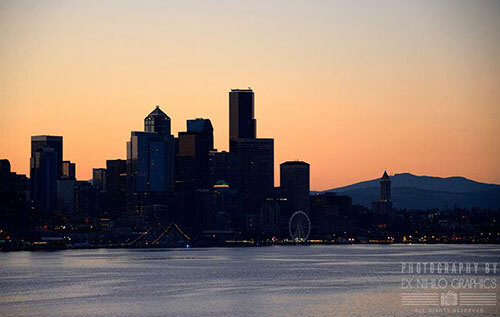 The ship will sail at 4:00 PM and we encourage you to visit the top deck for a great panoramic view of Seattle as the ship leaves Puget Sound and makes her way to the open sea. Also, enjoy a meal in the dining room and the evening service in the ship’s largest theater, The Mainstage. Saturday, July 7, 2018 4:00 P.M.
Sunday morning we encourage you to take advantage of a tasty breakfast and the worship service with Mike Speck in The Mainstage theater. After congregational worship and a sermon, you’ll have the day to yourself! 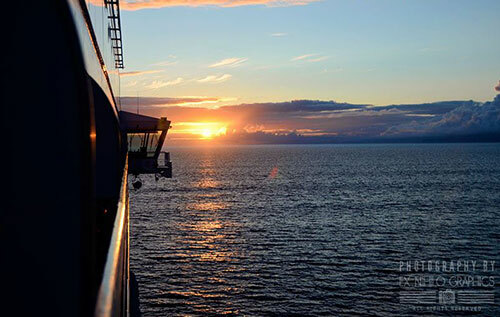 Enjoy onboard activities or relax on one of the ship’s many decks...and be sure to take your binoculars with you. You never know when you’ll spot a whale in the waters! 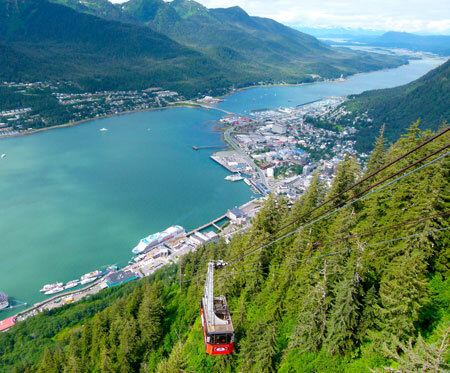 Juneau, Alaska is our first stop. 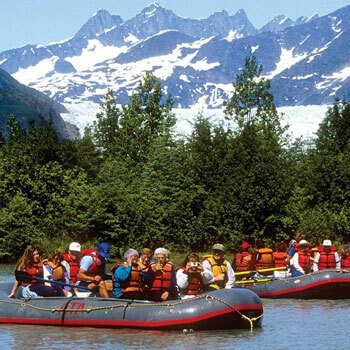 As you step onto Alaskan soil, you’ll notice that there are many things to do in the state’s capital. If you ask Mark for recommendations, he’ll tell you to skip lunch onboard and take an excursion to the Salmon Bake. The food is delicious! 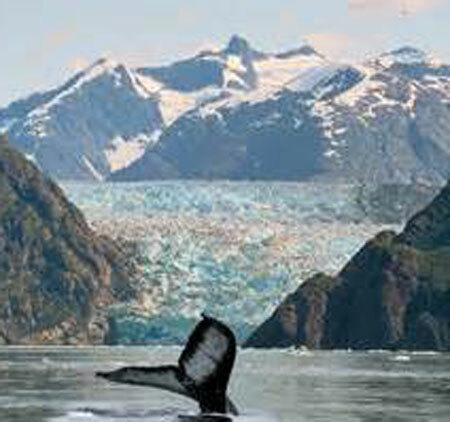 For outdoor activities, hire a cab and head to the Mendenhall Glacier and walk around the state park. Or, if you prefer to stay around town, there are plenty of shops and trails to walk near the downtown area. MTQ’s favorite excursion for this stop is the Salmon Bake. “After doing that excursion year after year you would think you would want to do something different,” Mark says, “but not so! 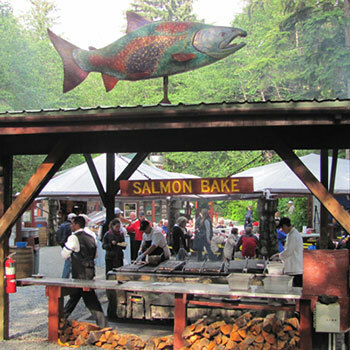 There’s nothing like it!” Cooked on an open grilled with brown sugar, honey and lemon juice and a fire pit to roast marshmallows in for dessert, you won’t find anything that tastes like that but in Juneau! 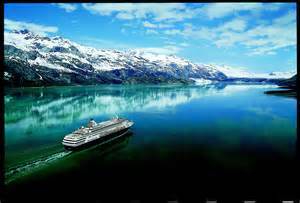 Monday, July 9, 2018 1:00 P.M.–12:00 A.M.
Tuesday, July 10, 2018 10:00 A.M. - 4:00 P.M.
Cruising Tracy Arm Fjord has the potential to become your favorite part of the cruise. Why? 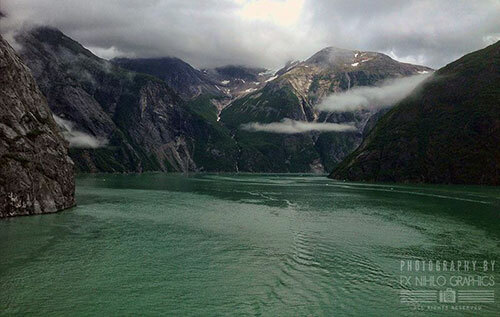 As the ship enters the narrow fjord at ten o’clock, the landscape becomes larger than life. Towering above you, the steel grey mountain sides pour forth streams of melted snow that descend into the glacial pool the ship glides through. When we finally reach the glacier, you will see the richest color of blue your eyes will ever behold. Also, be sure to pay attention to the shoreline on the cruise in and out of the fjord - bears, sea lions and other creatures can be seen on the water's edge as we pass by. 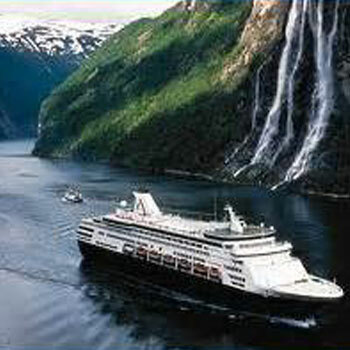 The Eurodam will come to anchor in the harbor of Sitka, where we will tender to shore. 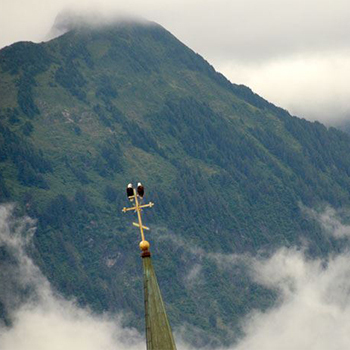 If you’ve seen photos of eagles sitting on top of cross, chances are it was taken in Sitka. We often say the eagles live on top of Saint Michael’s Cathedral just so cruisers can photograph them! 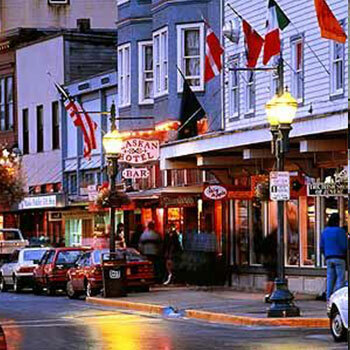 Sitka was Alaska’s original capital and has a rich Tlingit Indian and Russian history. 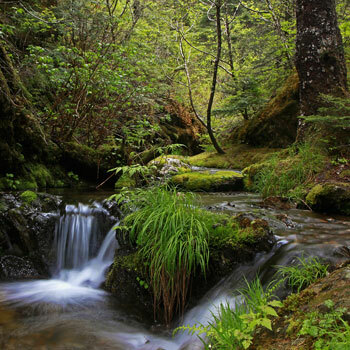 Experience how these cultures impacted the area with a tour through Saint Michael’s Cathedral, the Russian Bishop’s House or walk through Sitka National Historic Park. 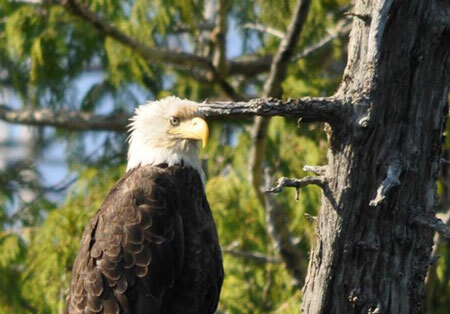 The photo of this eagle was taken in Sitka by Mark Trammell. These magnificent creatures call the surrounding parks and forests home, making regular appearances for visitors to photograph! 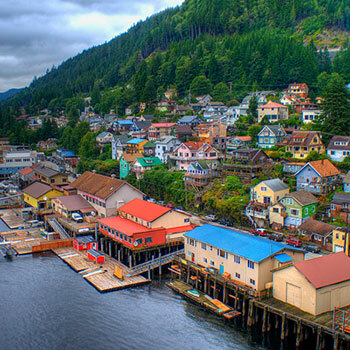 Wednesday, July 11, 2018 8:00 A.M. - 5:00 P.M.
Thursday, July 12, 2018 7:00 A.M.–1:00 P.M.
Ketchikan is the “Salmon Capital of the World,” which means, if you want to go fishing, Ketchikan is the place to do it! You can also enjoy a walk through town and visit the shops, ride the Cape Fox Elevator up to the lodge and see a breathtaking panoramic view of the town or walk down Creek Street and see the Salmon jumping! 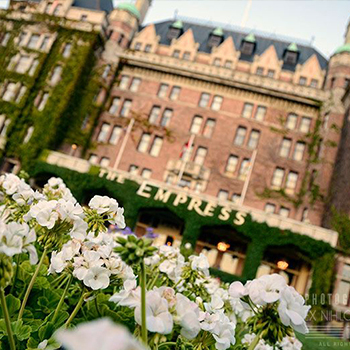 When we anchor in Victoria, Canada, you will feel like you walked into a life size garden. 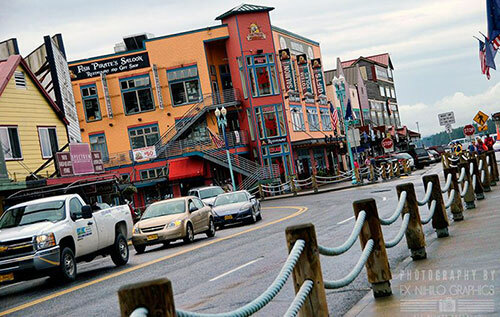 From the cruise pier, take a cab, carriage or bus into downtown Victoria where you can enjoy walking around the Inner Harbor, parliament buildings and the famous Empress Hotel. 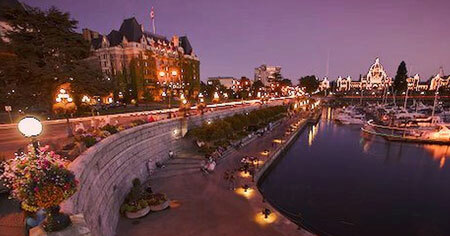 Victoria is known for the 3,000+ lights that illuminate the parliament buildings after dusk. Check out one of the local cafe’s, grab a coffee and enjoy the sights! Friday, July 13, 2018 6:00 P.M.–11:30 P.M.
Saturday morning our ship will dock in Seattle and the disembarkation process will be begin at eight o’clock. We wish you a safe flight home! All dates & locations subject to change. Most of her staterooms have ocean views and many have private verandahs. Every year, MTQ sails on Christian cruises taking Believers to ports of call all over North America. As you can imagine, they’ve been on the majority of cruise lines available...and nothing compares to the elegance and class of a Holland America ship. 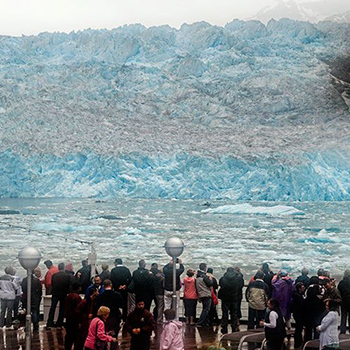 On the 2018 Alaska Cruise, you can experience this with MTQ on Holland America’s Eurodam. As you stroll along the decks, you’ll feel immersed in the grandeur of art, sailing and the Dutch heritage from which the ship hails. During the week, services and concerts will be hosted in the vessel’s largest theater, The Mainstage. Hear Dr. Charles Stanley and Andy Stanley preach and enjoy many of your favorite artists perform! 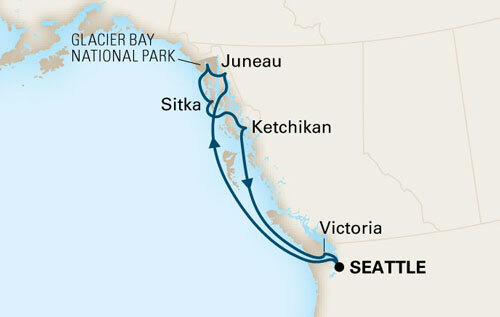 When we’re not on shore exploring Alaska’s beauty, relax in the Crow’s Nest with a pair of binoculars and watch for whales, browse through the In Touch Bookstore or enjoy fine dining in one of the ship's many restaurants. 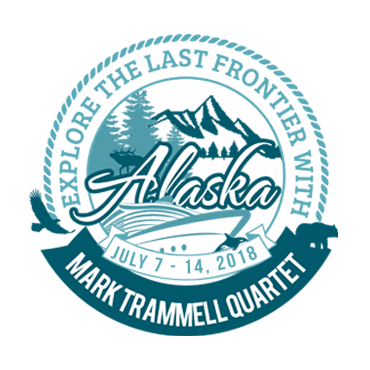 Call 888-400-2450 and ask the reservationist for more information on how to cruise with the MARK TRAMMELL QUARTET!